Vlade Divac is considering hiring Ettore Messina. 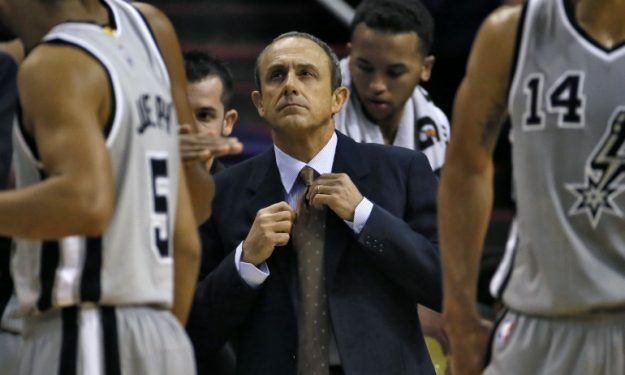 San Antonio Spurs assistant and former four-time EuroLeague champion Ettore Messina has emerged as a “strong” candidate for the head coach position of the Sacramento Kings, according to The Athletic’s Sam Amick. ESPN’s Adrian Wojnarowski reported that Kings General Manager Vlade Divac is planning to fire head coach Dave Joerger Thursday (11/4). Messina is among the list of head coaching potentials for the soon-to-be-vacant post, together with former New Orleans Pelicans coach Monty Williams. Messina had been interviewed by Milwaukee Bucks and the Toronto Raptors for the teams’ then open head coaching jobs last summer. The Italian coach has been an assistant on NBA teams for six years, having spent 2011-2012 with the L.A. Lakers and then all seasons from 2014 onward at the side of Gregg Popovich. UPDATE: The Sacramento Kings announced that Dave Joerger has been relieved of his duties as head coach of the team.